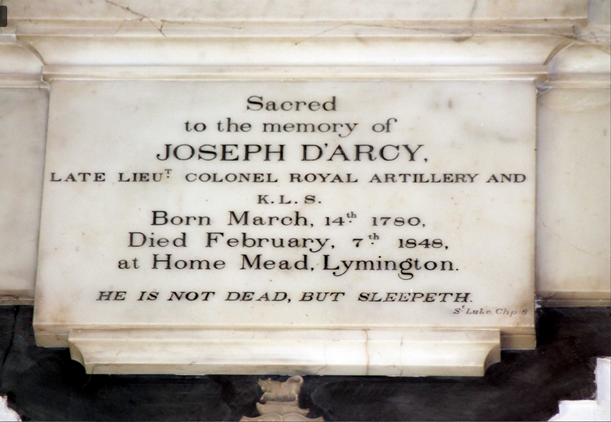 Lt Col Joseph D’Arcy lived in Milford in his later years and is buried at All Saints, Milford. He lived at Milford House in 1829, once the home of the Reynolds family, but at that time in the ownership of Mrs M A T Whitby of Newlands, moving later to Priestlands in Pennington in about 1834 and then Holme Mead, the site of the current Post Office in Lymington in 1846, where he died. D’Arcy had an interesting military career, serving in the disastrous West Indies campaign of 1795/6, and was present at Maida (1806), Copenhagen (1807) and Walcheren (1809). He then spent five years reforming the Persian army. 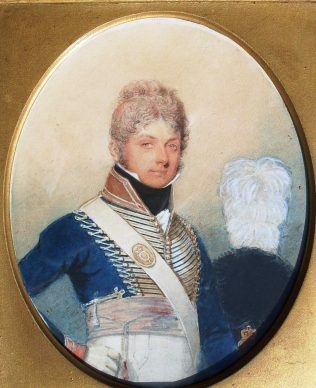 In the 1820s he was ADC to the Lord Lieutenant of Ireland, the Marquis of Wellesley (brother of the Duke of Wellington). His portrait shows him in the uniform of a Royal Artillery Officer wearing the Order of the Lion and Sun which had been presented by the Shah of Persia. 1. Lady Catherine West, daughter of 4th Earl de la Warr and hence a first cousin of Frederick Richard West the son-in-law of Mrs Whitby (three sons). 2. Catherine Hyde (five children). For more on Joseph D’Arcy’s family, see The D’Arcy Family.